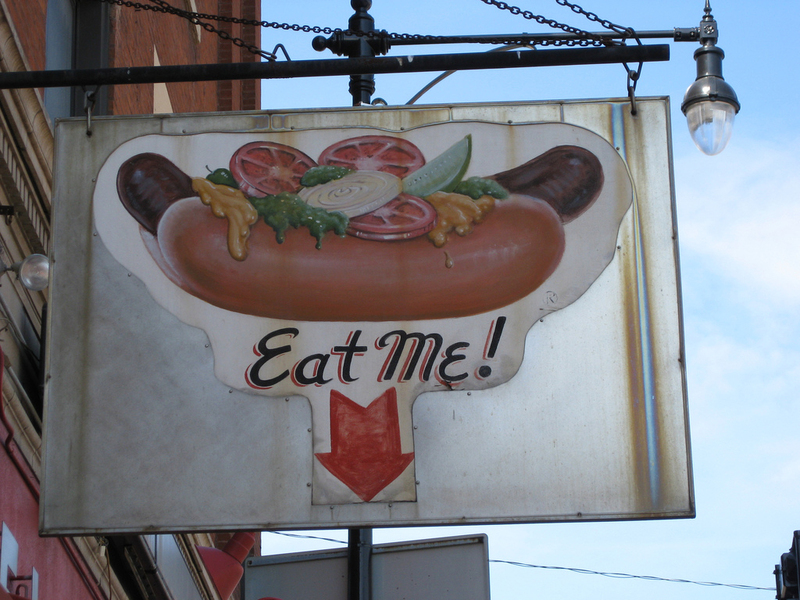 After a recent late-night adventure I found myself in need of a hotdog. We’ve all been there. Our bodies tend to be drawn towards certain cravings, which are stored in our subconscious mind and only come out when coerced by a combination of Lager and Malort. This particular evening I chose to ignore that certain craving as I was feeling a bit health conscious. 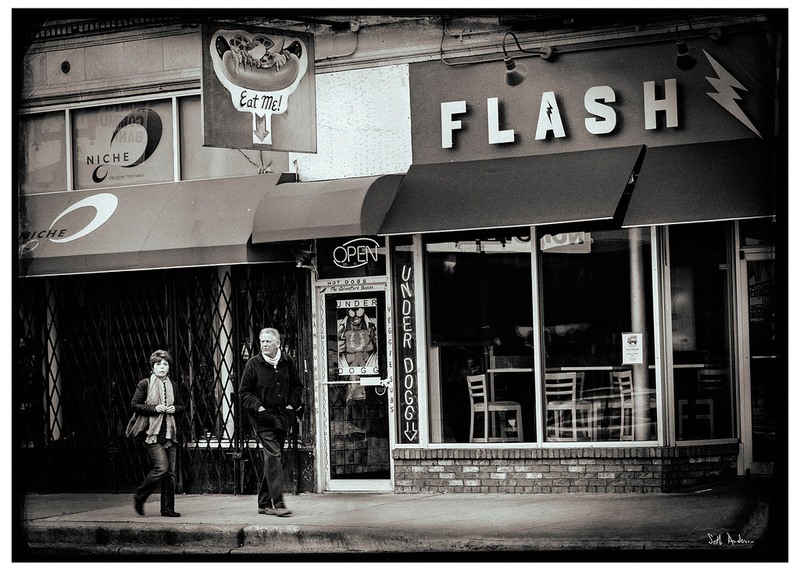 I decided to make a deal with myself, as one does, if by the time I woke up and still wanted a hotdog I would drag the girlfriend for an impromptu brunch at Underdog, now located under Flash Taco in what I consider the Heart of Wicker Park in the middle of the Six Corners. We woke up the next morning feeling as if we had a visit the night before from an elf with a baseball bat; it was a rough one. After some wheatgrass we were ready to conquer the day. I successfully convinced the girlfriend that brunch at Underdog was the right thing to do. And so it happened. We made the short drive north and braved the bitter cold for a few blocks. The concrete peninsula where it is located quickly came into sight just a little bit after they opened up for the day. 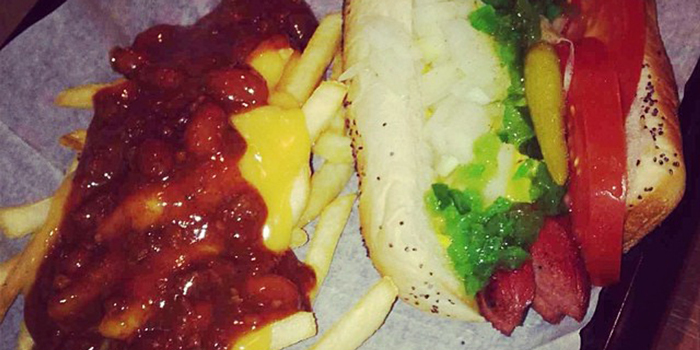 UnderDog has the feel of a garden apartment version of a hotdog stand. We were greeted by an 8.5×11 Sharpie-written sign informing us that the establishment was “Ca$h Only.” If you are one who is deterred by this sort of thing, be forewarned. I was so keen to go to UnderDog because in the buzz II have heard I discovered that they specialize in something called a Mexi-Dog. As a fan of over-the-top displays of Mexican-ness, my curiosity was more than piqued. As we perused the menu I was more than pleased to discover that not only did the Mexi-Dog exist, but it was actually a whole sub-genre of hot dogs that needed to be explored with immediate effect. We ordered a flight of hot dogs which consisted of the following and a pile of French fries. 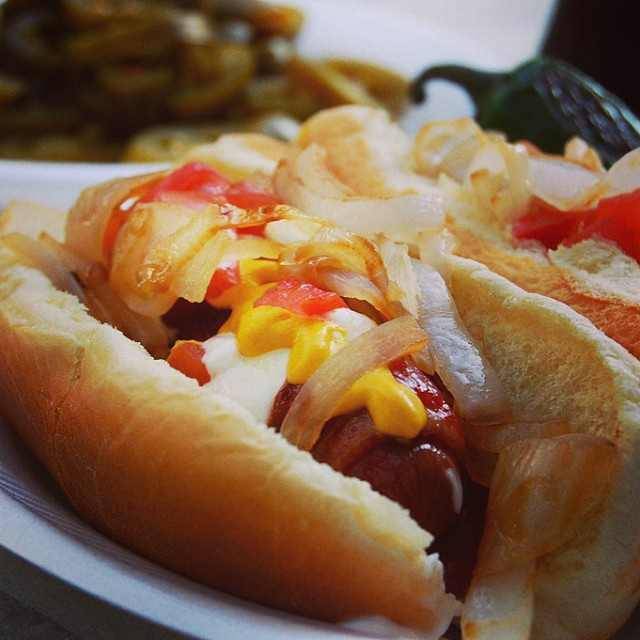 Chilango: grilled frank wrapped in bacon topped with mayo, ketchup, tomato, and grilled onions. 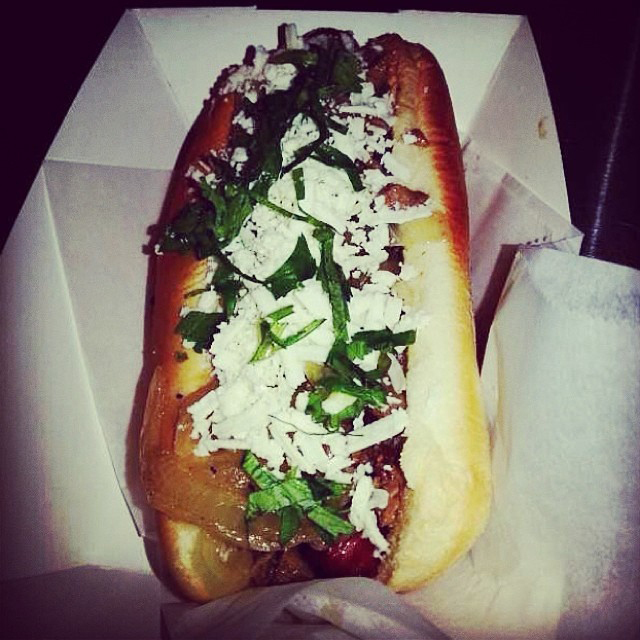 Panchito: grilled frank topped with grilled onions, carne asada, queso fresco and cilantro. Our gastro-journey was a unique one to say the least; I couldn’t help but to think that they were trying to reinvent the wheel when they designed their hot dog menu. The location itself was convenient for the audience that they are trying to target; the prices were more than reasonable; and their hours of operation make it a convenient place for a late-night snack. 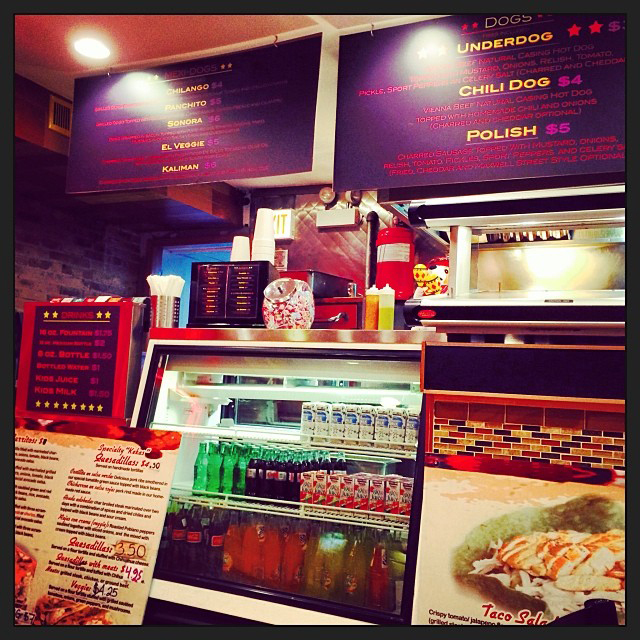 If you are looking for a change of pace when it comes to late night food I recommend giving underdog a try. 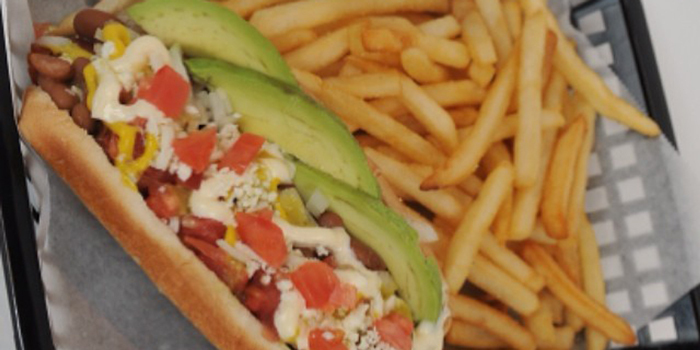 My personal favorite was El Veggie, as it was the most unique and had the most interesting flavor profile, but that might have just been my fascination with the novel concept of a vegetarian hot dog.